The project in Beijing by the Chinese architecture firm, Chiasmus Partners Inc. for its venue of the famous New York Jazz Club called Blue Note is located inside an existing building that is in itself a landmark, the former American consulate of the Qing dynasty in the Beijing Legation Quarter very close to the Forbidden City. Times change and architecture marks these changes with landmark buildings in the urban fabric that tell the stories of the past and unlock the future. In this respect, an outstanding example of architectural rehabilitation that sets up a new connection with the city is the Blue Note Jazz Club in Beijing by Chiasmus Partners Inc.
A tricky challenge because it involved bringing an icon of the Western musical world into the Beijing Legation Quarter, where a number of foreign legations were located between 1861 and 1959. In the Chinese language, the area is known as Dong Jiaomin Xiang, which is the name of the hutong (lane or small street) running through the area. It is located in the Dongcheng District, immediately to the east of Tiananmen Square. 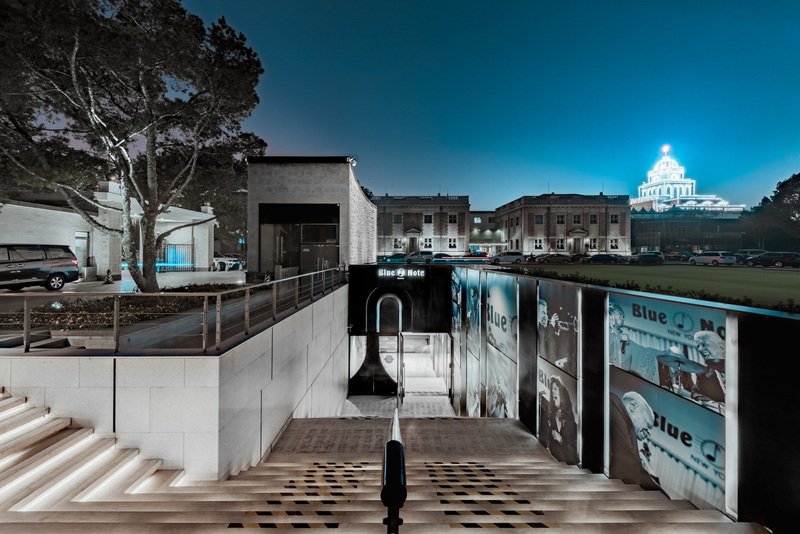 The project for the Blue Note Jazz Club, by Chiasmus Partners Inc., unfolds in the courtyard of this landmark complex, mostly underground with a long, wide staircase to the east that serves as the entrance. The spatial rhythm of the interiors is inspired by both music and by the intricate web of hutongs in the old town, with long corridors, twists and turns and even a visual play on the various volumes. So you slowly move downwards from the street level - the inner garden of the existing architectural complex - on a long, wide staircase reminiscent of metro stairs, which ends at the entrance lobby that also has an adjoining jazz music store and bar. Then you turn right and head along a long, narrow, tunnel-like corridor flanked by a timeline describing the history of jazz. The end of the tunnel opens onto the large hall 5 metres below street level. This is a meeting place, a hub that also accommodates the venue's services and facilities: ticketing, offices and restrooms are located here. Then from here, you can move on to the VIP area, the rehearsal room and the real heart of the project. 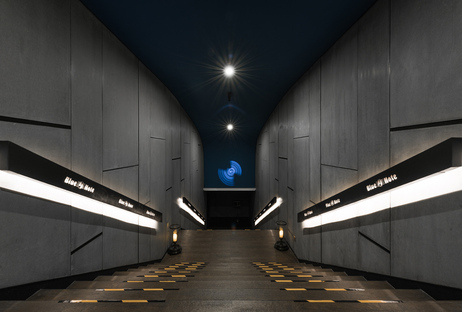 In tune with the location's name, Blue Note, you continue down a mysterious blue staircase with a curved ceiling, to the main performance space, an impressive volume that suddenly paves the way for the underground experience. The stage is wider than it is deep and sits horizontally, making it easier to see all the musicians who have more room to move. This design decision by Chiasmus Partners Inc. warms up the cool ambience of the space by keeping the audience as close as possible to the performers. The stage level can hold up to about 240 people and all the seating is flexible and removable to accommodate programmes that differ from standard events. Seven viewing boxes of different sizes are located on the railed upper level. The materials palette of the interiors is quite simple - black metal, pressed-concrete slabs and perforated metal panels with soundproofing for the walls, wooden floors, leather furniture and sound-absorbent ceilings. 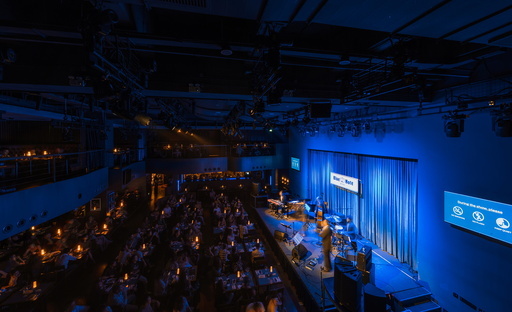 Reminiscent of a smoky jazz club, lighting is kept dimmed and focuses mainly on the stage and the musicians, with blue accents referencing the brand. 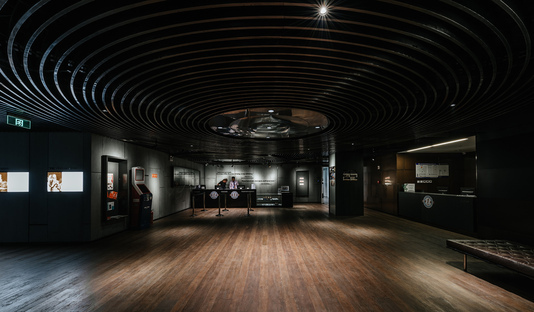 The Blue Note Jazz Club in Beijing is the largest of its kind in the world. This not only ensures utmost comfort for musicians and audiences but is also respectful of the monumental urban context of great historical value, just a few steps from the Forbidden City. Architectural project and interior design: Chiasmus Partners Inc.